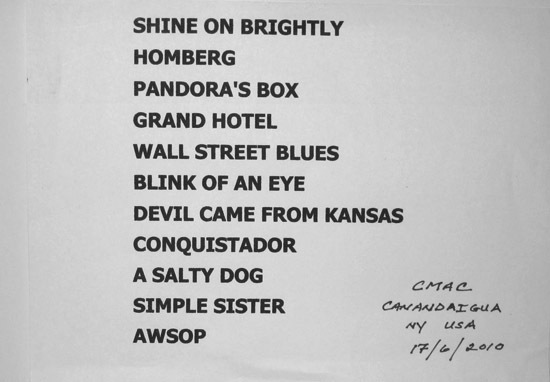 I am sending [left] a copy of the set list from the Canandaigua show last night. I ran down to the stage as they were striking the Procol Harum set and asked one of the stage hands to peel it off the floor for me. This was the copy that Matt Pegg used. It was thrilling to see the band again exactly nine years to day from that wonderful experience I had in Manchester. The standing ovations were very encouraging and only enforce my (and all other Procoholics') belief that the band could and should headline a major US tour.